Flags with 39 stars are very scarce compared to flags of 38 stars, which were official for more than 13 years, but in the same day, the official star count jumped from 38 stars to 40 stars, with the introduction of both North Dakota and South Dakota on the same day. Just 6 days later, the introduction of Montana, followed by the introduction of Washington State just 3 days after that, brought the star count from 38 to 42 in less than a two week period. Though 39 star printed flags are encountered occasionally, since flag makers made them in anticipation of at least one state coming into the union in 1889, those of pieced and sewn construction, and in particular those that are homemade, are very rare and almost never encountered. This particular flag has a fantastic medallion pattern with stars that are carefully arranged tip to tip. The effect is a very geometric and folky pattern, which form a design of nested pentagons. As a result of the star placement, the voids between the stars are very symmetrical. The pattern has a quilt-like symmetry to it, and the seamstress who made the flag very carefully stitched the stars into position by hand. The flag is made of cotton, with an unusual hoist made of the same blue fabric as the canton. 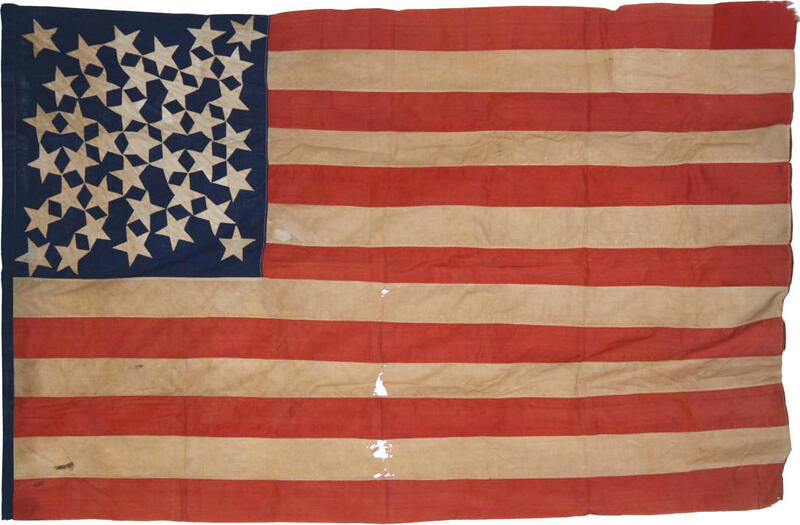 This adds another interesting visual characteristic to an already rare and beautiful 19th century American flag. Learn more about Medallion Pattern flags.